With autumn in full swing, we’re finding ourselves drawn to anything apple these days. 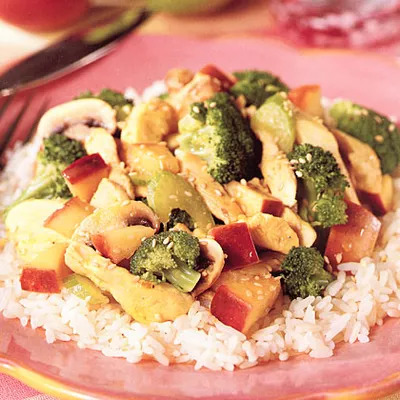 This includes fall staples like apple cider and apple crisp, but also less traditional incarnations of the fall fruit, such as this recipe for apple-sesame chicken. If, like us, you’ve been looking for a way to take that apple obsession to the dinner table, then this is your dish. This stir fry recipe is a cinch to make (total prep and cooking time is under 30 minutes!) Plus, no need to think about side dishes--the broccoli, mushrooms, apple, and chicken provide a great balance of protein and nutrient-rich produce. Bonus: It's also low in saturated fat. Seasonal, delicious, and healthy? It's a perfect recipe to have on hand for impromptu dinners with friends.